ARCATA FORESTS – The Forest Management Committee (FMC) met Thursday, Dec. 13 to mull Arcata’s ever-changing forest scene. With the City’s forest holdings steadily increasing as well as projects designed to enhance and make them more accessible to citizens as well as boost their scientific yield, there is always a lot to talk about. One key way the City maintains its wooded areas and the creeks and trails within them is with use of volunteers on volunteer workdays (see page 8). Another way is with work crews from California Department of Corrections work crews. The low-offense prisoners also volunteer for the duty, and enjoy working in the outdoors and beholding the sights in the college town of Arcata. California’s catastrophic financial condition is putting availability of prisoner labor in question. As part of the relaignment of the Dept. of Corrections, county jails are being asked to absorb some 4,000 prisoners from state-run incarceration facilities such as the High Rock Conservation Camp, which supplies many of Arcata’s work crews, by next July. Committeemember Yana Valachovic said she had looked into the matter, and that the prison labor pool didn’t look to be imperiled. She is also interested in the effect the environmental work has on the inmates. This was good news to the committee. “It’s so refreshing that we have some kind of surplus in America,” quipped Committeemember Danny Hagans. Environmenal Services Director Mark Andre said that a couple of loads of redwood timber had been made available to the High Rock Conservation Camp for projects there in return for $3,500 credit. “That’s a couple months of that crew working for us,” Andre said. Nonetheless, the committee will ask a representative from the California Dept. of Forestry and Fire Protection to attend a meeting and clarify the situation. In addition, Andre will draft a letter for the City Council to sign off on, explaining the benefits of prisoner labor and soliciting the support of Assemblymember Wes Chesbro and State Sen. Noreen Evans. “We’re just trying to make sure everyone knows the importance to us,” Andre said later. A big new project now in the talking stages involves proposed establishment of a 978-acre research forest bordering the City’s Jacoby Creek Forest. Just 40 acres would be owned by the City and the rest by Humboldt State. It would be jointly managed by the City and Humboldt State’s Forestry Dept. The City is seeking grants from the Wildlife Conservation Board to acquire the property, which is presently owned by Emerson, R.H. and Son, LLC – otherwise known as Sierra Pacific Industries. The acquisition and its co-management by the City and HSU could require a new management vehicle other than, or perhaps augmenting, the existing FMC via a subcommittee. Andre noted the presence of numerous old growth Western red cedars in the area. “It could be a real positive for Humboldt State and the City,” said Frank Whitlach, HSU associate vice president for Marketing & Communications. He said a plot of forestland dedicated to research could be useful to many areas of Humboldt State’s curriculum, including forestry, fisheries, botany, wildlife, geography and soils studies. “There are all sorts of programs that could benefit,” he said. Whitlach stressed that the project is in extremely preliminary stages. He said grants and private support would have to be secured to make it a reality. Should it come to pass, the research forest would be administererd by the Advancement Foundation, a non-profit organization independent of the State of California, as are other ancillary programs managed by HSU. Andre said a concurrent effort is to better coordinate with HSU over the research studies it already conducts in the Arcata Community Forest. He said that work could help the City fulfill its scientific research objectives and assist with planning. Outside the warm confines of City Hall, in the damp and dark recesses of the forest, improvement work continues. A Dec. 15 volunteer workday in the Sunny Brae Forest included rocking and replanting of the upper Beith Creek watershed. Old logging roads there have been removed and their hillside locations recontoured to eventually erase any trace. These and similar projects, in an odd metaphor used by Andre at the meeting, “pave the way” for an amendment of the City’s Non-Industrial Timber Management Plan. 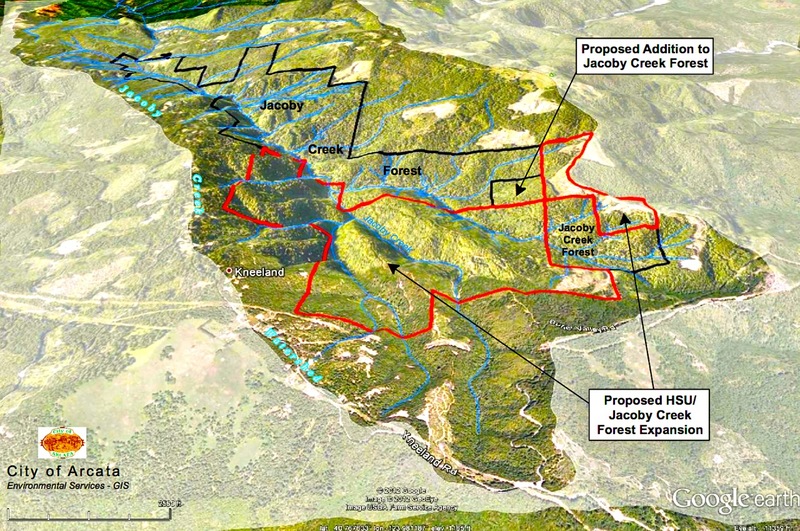 That document governs the way Arcata’s forests are run, but must be updated to include all the recent acquisitions and projects. The more that is accomplished on the ground, the smaller the to-do list on the application. “We’re getting close to submitting it,” Andre said. Arcata’s forests and their innovative management continue to attract interest from professionals elsewhere. The latest in a long line of delegations to tour the woods recently were visiting representatives from the Buckeye Conservancy and the Forest Guild. They inspected the Sunny Brae Forest in which roads have been removed. The Arcata Ridge Trail (ART) continues to advance. Two grant applications have been submitted to further enhance the trail. A two mile-long loop trail at the ART’s midpoint has been scouted, and could be enhanced with picnic tables and signage. A formal trailhead is also planned for the ART’s northern portal on West End Road. This entry was posted on Monday, December 31st, 2012 at 1:13 pm	and is filed under News, Environment, Humboldt State. You can follow any responses to this entry through the RSS 2.0 feed.